A hip flexor injury is common among certain athletes who spend a lot of time kicking their legs. A hip injury in general can be mildly irritating or seriously painful. Your sports medicine and pain management team in Midtown Manhattan get you back in the game with effective hip flexor injury treatment that targets your specific needs. Hip injury treatment designed for you gets you mobile again as quickly as possible. The thigh bone’s connected to the pelvis bone — and that connection is called the hip. Your hip is a joint, actually a ball-and-socket joint, because the tip of your thigh bone moves within a cup-like socket in the hip joint on either side. Your hips are two of the strongest joints in your body and can take a lot of pressure when they’re healthy. A hip injury or hip flexor injury can really take a toll on your activities because so much of your mobility relies on the smooth motions of your hip joints. Your New York City sports medicine doctor understands the importance of maintaining strong, healthy hip joints. He provides the most effective hip injury treatment when you need it. Your Manhattan pain management team can best diagnose your hip injury when you can clearly explain where it hurts, when the pain first began and what makes it feel better or worse. When your hip pain is primarily in your groin area or in your hip, that usually indicates a hip joint problem. When your feel the pain on the outside area of your hip, buttocks or thigh, that typically leads your doctor to believe there’s an issue with the hip flexors and other soft tissues around the hip joint. Pain also can be referred to your hip from lower back pain issues, too. In addition to a thorough history and physical exam, your NYC doctor may order tests such as x-rays, an MRI, ultrasound or CT scan to determine the exact cause of your discomfort or to rule out other causes. Non-surgical options for hip injury treatment could include special exercises and physical therapy, while steroid injections give the strain enough time to heal, usually two to three weeks. A labral tear may require minimally invasive arthroscopic surgery. And when all else fails, you can receive a partial or total hip replacement. Do you have any questions about the hip injury treatment we offer in NYC? 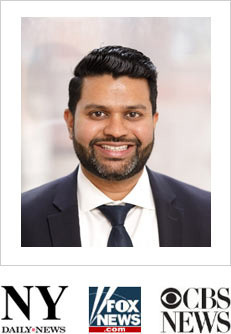 Would you like to schedule an appointment with the best rated hip pain management doctor Febin Melepura MD of sports injury clinic in New York? Please contact our office for consultation with the pain relief specialist in Midtown Manhattan.